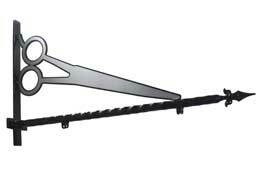 These speciality hanging brackets are designed for hairdressers or barbers. This is our new range of speciality hanging sign brackets designed for hairdressers, barbers, hat shops, boutiques, opticians, tea rooms, cafes and coffee shops. The various designs are lazer cut from 3mm thick mild steel and then galvanised and powder coated to make it last. The cross base is laser cut from 8mm plate steel with 3 fixing holes. The projecting arm is either 25 x 25mm antique hammered mild steel or 40 x 40mm box steel. This range of sign bracket is supplied with free wall fixings.